Amazon web services maintaining its dominance as the largest provider with 31% of the market share and a 48% growth, ranking first place. 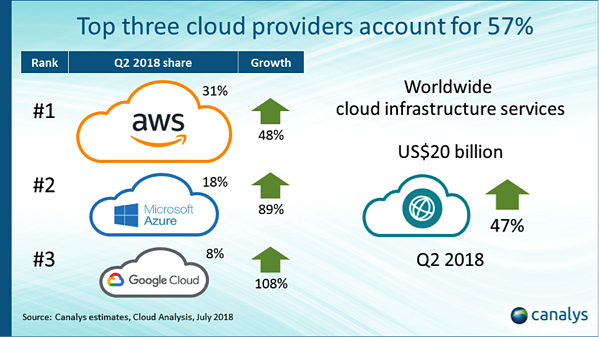 Microsoft Azure continues to grow faster than AWS with an increase of 89% in growth, gaining 18% of the market share ranking second. Google Cloud growth has increased a whopping 108% on the same quarter in 2017 owning 8% ranking third. Microsoft has a good chance of becoming the first tech vendor to reach $7 billion in quarterly commercial-cloud revenue when it releases earnings on July 19 while Amazon could very well hit $6 billion in AWS revenue when its numbers come out later in the month. While Microsoft doesn't reveal its exact Azure earnings, Canalys estimates Azure revenues in Q2 were 18 percent of the total cloud infrastructure spend. Google Cloud CEO Diane Greene told CNBC she thought that people were underestimating the scale of Google’s cloud businesses and she thinks that’s still the case today, too. Even with the rapid growth in cloud infrastructure, not everyone is on board with placing everything in the public cloud and leveraging a Hybrid IT approach, Canalys research analyst Daniel Liu believes. As the adoption of cloud services shows no signs of slowing down, it's almost inevitable that your organisation will be increasing it's footprint across one or more providers. Hava provides a simple way to discover and diagram your cloud architecture straight from the source of truth, giving your team insight to diagnose the things that matter.